The mountain of Nemrut Dagi has been well–designated as a “World Heritage” site by UNESCO. The mountain is 7,050 ft. [2,150 m.] high and is crowned by the worship center and burial tumulus of the Commagene king Antiochus I Epiphanes. The site was discovered in 1881 and since 1984 the restoration of the site has been underway. 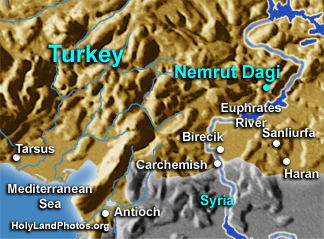 The kingdom of Commagene was located on western bank of the upper Euphrates River. To the west was the area of Seleucia and later Rome, while to the east was Parthia. The Commagenes seemed to pride themselves as being mediators, or inheritors, of both western and eastern traditions. This is reflected in their artwork and in the fact that the rulers traced their ancestry back to both the Persians (on the paternal side) and to Alexander the Great (on the maternal side)! It was made an independent kingdom in 162 B.C. Its high point seems to have been in the first centuries B.C. and A.D. In A.D. 72 it was dissolved and divided between the Roman provinces of Syria and Cilicia.